The sophomore standout is coming off a game where he tied the state record with 10 touchdown passes. Reaction across the state to Kennedy Catholic’s blowout win against Chief Sealth was mixed. The Lancers, who are seventh in The Seattle Times’ Class 4A state rankings, won 72-20 behind 10 touchdown passes from sophomore quarterback Sam Huard, which tied the state record for a game. He was 19-of-31 passing for 552 yards in the opener. While online commenters complained about Kennedy’s decision to continue to pass and others praised Huard’s talent, Bothell coach Tom Bainter busied himself with plans to stop a repeat performance. The Cougars (1-0) host the Lancers (1-0) in a nonleague game Saturday at Pop Keeney Stadium at 7 p.m.
Bothell traveled to Colorado to play Legacy, winning the Week 1 matchup 40-13, but they did not face much of passing game due to quarterback injuries. Cougars senior defensive leaders Darius Kubalanza and Mason Locknane will be tested against Kennedy’s fleet of receivers. Huard, the son of University of Washington and NFL quarterback Damon, led the Lancers to 32 points in the first quarter against Chief Sealth. Kennedy coach Sheldon Cross said he played everyone who traveled in efforts to control the game. ROOT Sports kicks off its high-school football broadcast schedule with a matchup between a pair of top-ranked Class 2A schools. 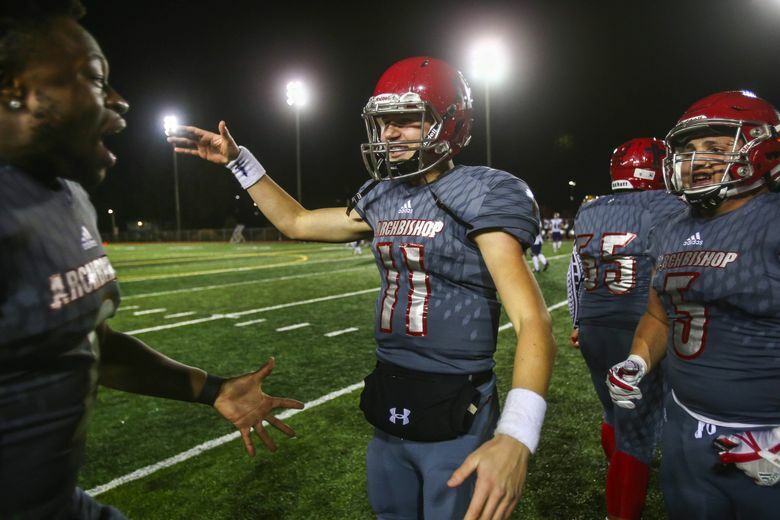 Archbishop Murphy, which is third in The Seattle Times rankings, will host No. 1 Hockinson on Thursday at 7 p.m. The matchup is the first of seven Thursday-night games the station will air in the regular season. Hockinson (1-0) won the Class 2A state championship last year. The Hawks return three-star receiver/linebacker Sawyer Racanelli but have a new quarterback in junior Levi Crum. AMHS (1-0) lost in the state semifinals. It returns junior quarterback Victor Gabalis. Senior kicker Max Henderson was impressive in the season opener last week, hitting field goals from 18, 22, and 37 yards in addition to scoring the two PATs in a win against Eatonville. Garfield will attempt to become the second Class 3A school to hand a loss to Central Valley, a Class 4A school from Spokane Valley. The schools play Saturday as part of the Memorial Football Classic. The Bears, which advanced to the state tournament semifinals last year, lost 18-7 to Bellevue to open the season. The fourth-ranked Wolverines rushed 322 yards and didn’t throw a single pass. Garfield, which traveled to Oregon to collect a win against La Salle last week, will switch it up on offense and rely on five-star junior linebacker Sav’ell Smalls and sophomore defensive end Antwan Brown on defense. Mt. Si coach Charlie Kinnune collected career win No. 150 in the school’s season-opener against Wenatchee. In his 27th season, Kinnune’s Wildcats are continuing its airshow with quarterback Cale Millen and receiver Jonny Barrett. Millen, son of former UW and NFL quarterback Hugh, threw four touchdown passes. Barrett caught three of those, finishing with seven receptions for 150 yards. Mt. Si, ranked No. 2 in the state, travels to play at Kentwood (0-1) on Friday.